I was absolutely thrilled to receive an invitation to the "Breaking the Rules" dinner at Woodland House, a special event they put on for Good Beer Week. 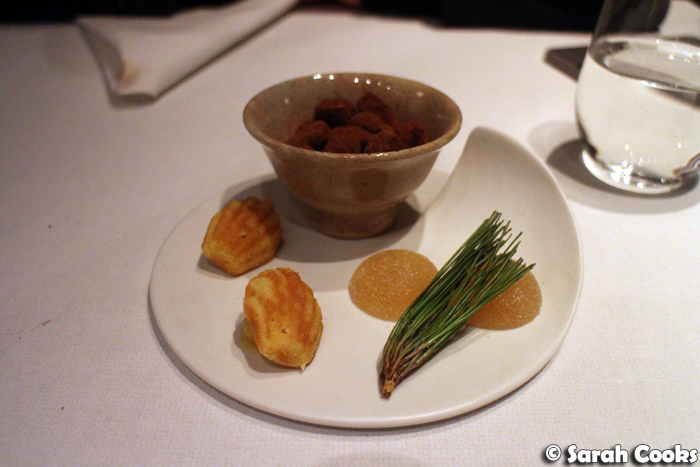 Woodland House is the new incarnation of iconic Jacques Reymond, which I loved when I visited in 1999 and again in November 2013, so I was greatly looking forward to trying it out. For this special event dinner, the restaurant broke their food and wine matching rules, and created a five course tasting menu, matched with a selection of small batch and exclusive beers from some of their favourite local breweries. 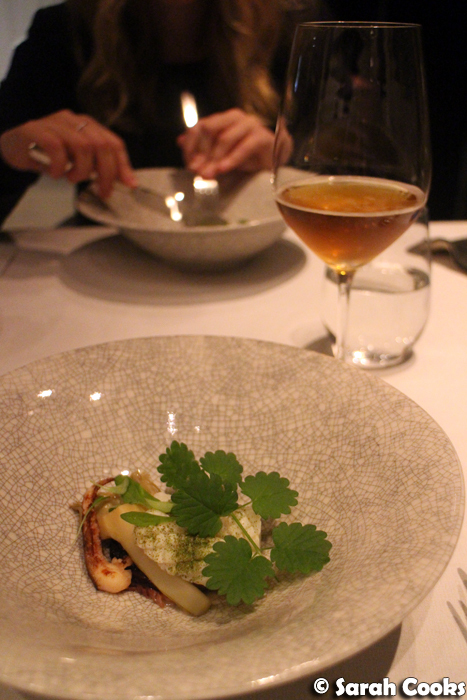 To start: a light beer and some delectable amuse bouches. These purple congo potato chips were incredibly thin, light and crispy. I loved the purple colour too! 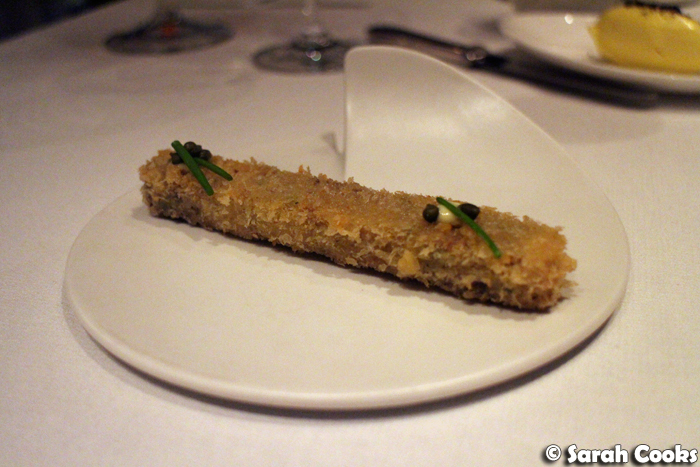 The crumbed pork rilette was perfect drinking food - crunchy and hot, with lots of tender pork pieces encased in the crisp crumbing. Freshly baked bread was brought around - white, wholemeal, cheese brioche - and it kept being replenished throughout the evening. Hooray. 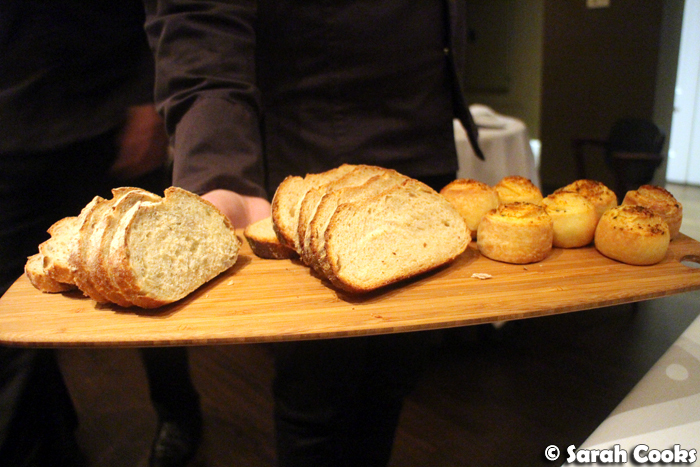 I know they say not to fill up on bread, but trust me, it is worth it to fill up on this bread! 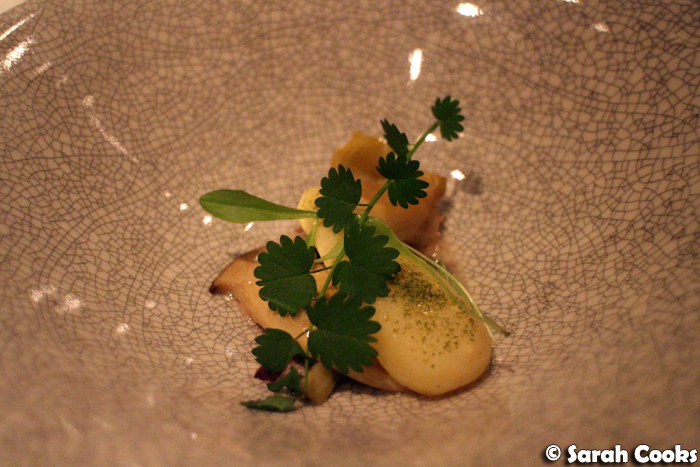 The first course proper was a tender braised squid, with lovage, dandelion and the bitterness of braised radicchio. The beer match, Dainton Family's 'The Good Son' Golden Ale, was quite a mild and clean-tasting pale ale which matched the delicate flavours of the squid well. For Sandra, our resident non-seafood eater, the squid was replaced with vegetables. 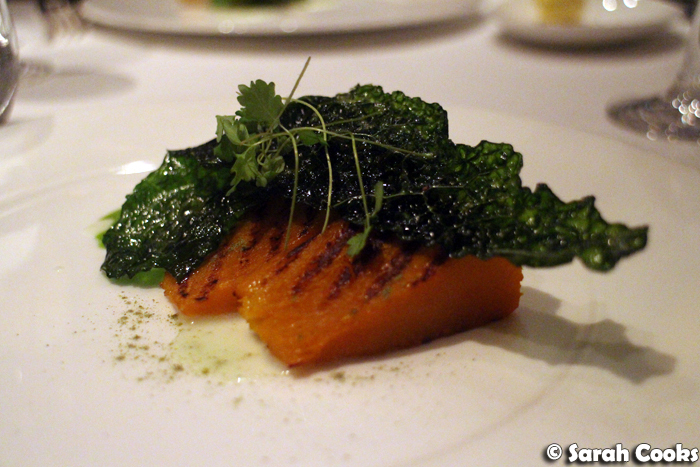 The second course comprised a perfectly cooked piece of John Dory on top of sea vegetables, topped with a crisp piece of (I believe) kale, and finely shaved bottarga. 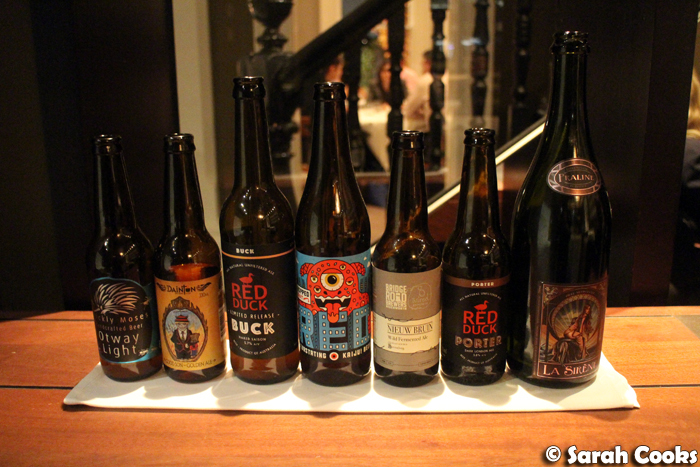 The Red Duck 'Buck' Naked Saison was quite light and fresh - I found it to be quite an easy-drinking beer. The non-seafood version of this dish was made with pumpkin. It was really pretty but Sandra found it a little bland - I think it is hard to replicate the rounded saltiness of bottarga without using seafood. 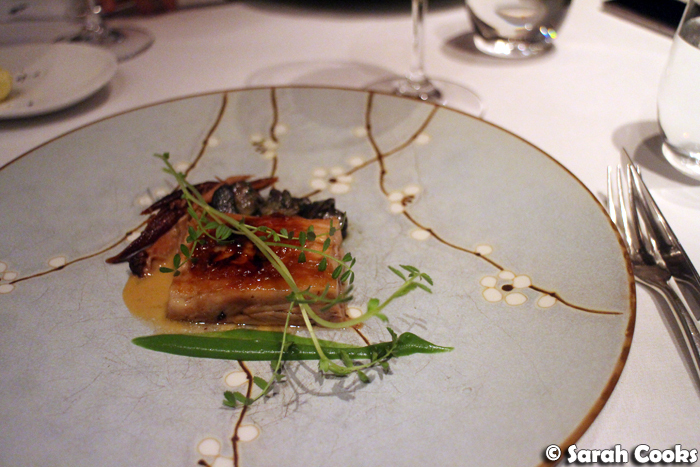 The pork was my favourite out of all the savoury courses. The pig tail was very tender, with a thin layer of fat on the top, and a sweet caramelised topping, almost like a crème brûlée. I also really liked the vibrantly green parsley sauce. 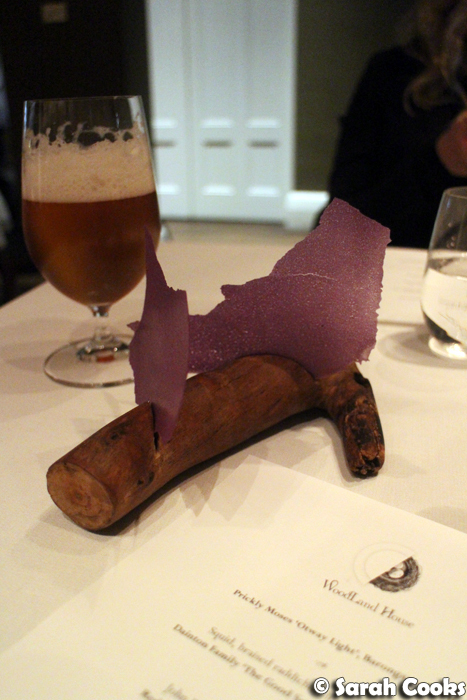 This dish was matched with a very local beer (just made down the street, in Prahran! ), the Kaiju 'Hopped Out' Red Ale. This was a bit heavier than the previous beers, with a slightly biscuitty malt taste. 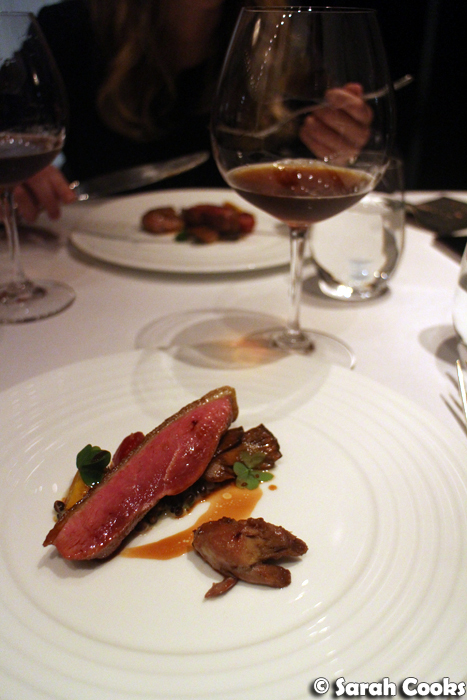 The duck dish was also very impressive - a very rare slice of duck breast was served on top of black barley, and the whole dish was lightened with the addition of sour plums. The matching beer, the Nieuw Bruin, was the most unusual one of the evening - to make it, a base beer of a rich malty ale was fermented in Cognac barrels, and then inoculated with Chardonnay yeast. The beer was very complex, with darkness, sour notes, a bit of malt and a lot of other flavours. I really liked it. 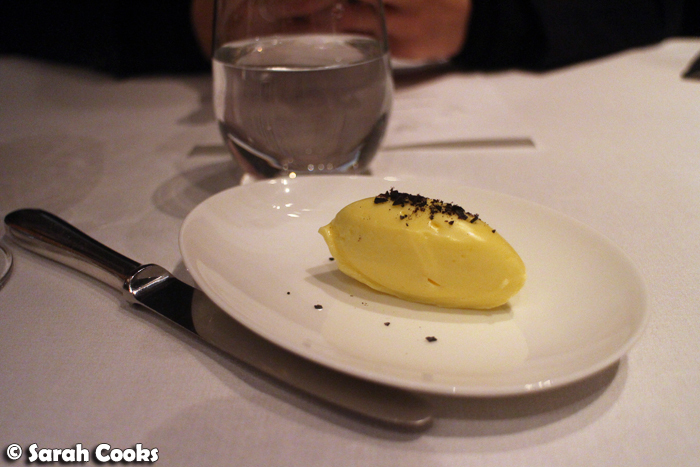 And then diners were surprised with a bonus cheese course! 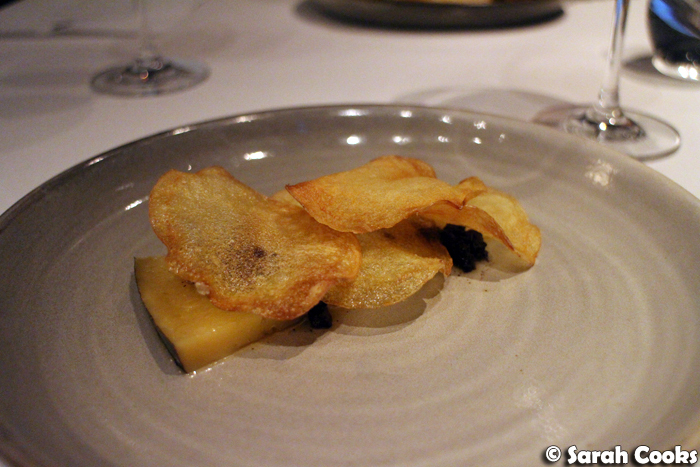 The cheese was served slightly warm, and was topped with boudin noir and crisp potato chips. It was a novel way of presenting cheese, and so delicious! This was matched with a dark beer, the Red Duck 'Porter'. It was dark, malty and quite rich, with a hint of a toffee flavour to it. The dessert was so fun! Our waiter described it as being like all the best desserts combined into one. 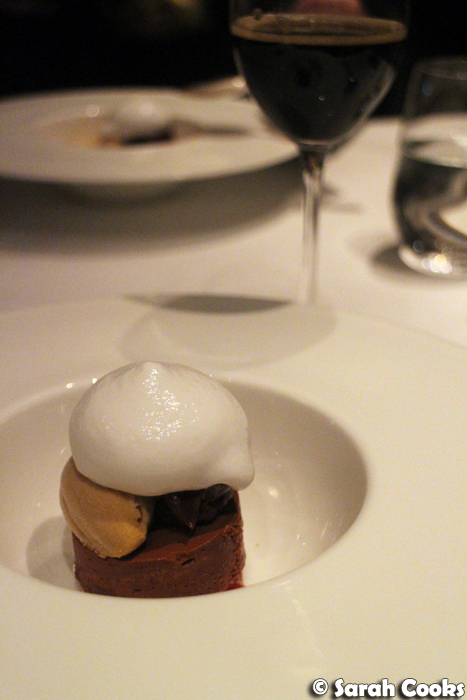 There was a chocolate parfait base, a quenelle of caramel ice cream, chunks of nougat, caramelised apple, elderberries, raisins and a cap of fluffy meringue. This was matched with a chocolate ale. On reading the menu, I thought the idea of a chocolate ale might just be a novelty, but it was actually really nice - brewed with vanilla pods and cacao nibs, it had a smooth and rich taste. And I thought we were all done... but then each table was presented with a pretty plate of petits fours. There were fresh madeleines with lemon curd, chewy lemon jubcs, and - my favourite - caramelised almond chocolates, dusted in cocoa. I was super full but couldn't help and go back for those almonds. So compulsively delicious! 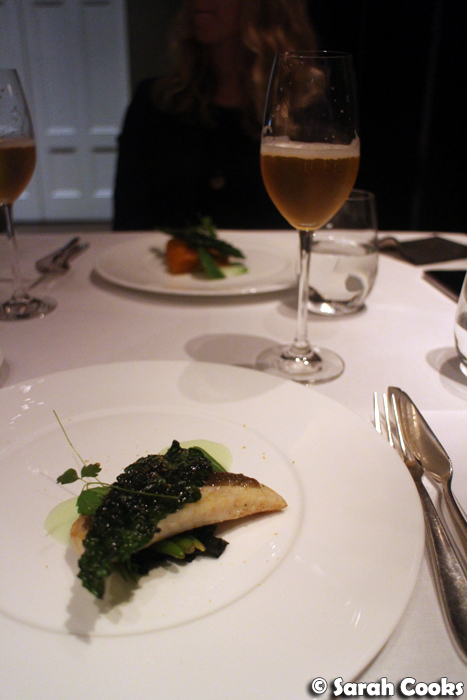 We were incredibly impressed by the Breaking the Rules dinner at Woodland House. This particular event was priced at $135 a head inclusive of all beers and food, which I thought was great value, especially considering the quality, quantity, and variety of food and beers. I also love how they included lots of little extras for the diners, like the amuse bouches, the incredible bread, the cheese and the petits fours. Based on this experience I would definitely want to head back for another meal on my own coin, whether it be a once-off special event for a festival, or their standard, rule-abiding, lunch or dinner offering. Sarah and Sandra dined as guests of Woodland House. Wow I wouldn't have expected that to cost $135 per person from your pics and descriptions! The food looks fantastic! I can never resist good bread either! Especially with awesome butter. Carbs be damned! Ooh that all looked really yummy, and very pretty too!